Small Grains Tour 1 8:15 a.m.
Small Grains Tour 2 10:20 a.m.
Sugarbeet tours (2) 1:00 p.m. Crop & Soils Day is intended for producers and agricultural professionals. In case of rain, a modified program will be presented indoors and the speakers will be available for consultation. Registration opens at 7:45 a.m.
Wagons will be loaded and tours will start promptly at 8:15.
take the other tour after the break at 10:20 a.m. 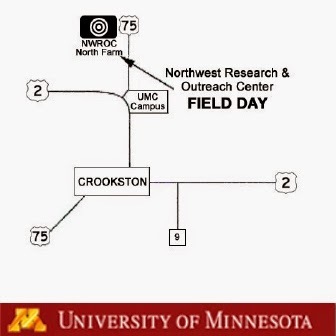 Registration opens at 12:30 p.m.
Load wagons and begin tour at 1:00 p.m.
Crops and Soils Day will be held at NWROC’s north farm, located one mile north of the University of Minnesota Crookston campus on Highway 75 North.